Firefox Quantum: Faster than anything we've seen before! :DomainGang Firefox Quantum: Faster than anything we've seen before! Firefox Quantum: Faster than anything we’ve seen before! 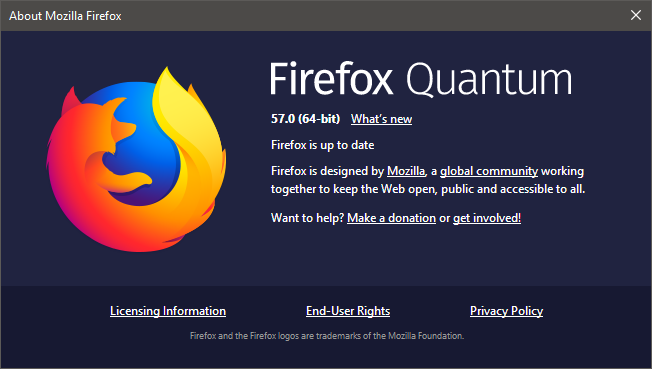 Firefox 57 aka “Quantum” has been released. This is not a simple update, but an entirely new engine. And boy, it’s fast. Really fast. It’s over twice as fast as Firefox from 6 months ago, built on a completely overhauled core engine with a clean, modern interface. Firefox Quantum is designed to browse the internet on Windows, macOS, and Linux; on Android, speed improvements are landing as well, and both Android and iOS have a new look and feel. On Windows 10, Firefox Quantum feels as if it’s there is no delay in processing requests and rendering web pages. Even one of the most stubborn sites, CNN.com, loads instantly. At the same time, CPU use is remarkably low, while the memory footprint appears to be kept in check; we did not witness any memory leaks. The main issue with Firefox Quantum is that many popular add-ons are obsolete. But that’s a small price to pay for having a brand new, ultra-fast browser, and eventually the non-compatible add-ons will be reprogrammed. Naturally, the Mozilla Foundation registered FirefoxQuantum.com, while the .net and .org were registered by someone in China.